Introducing her as “my best friend in the world, my closest confidante, my No. 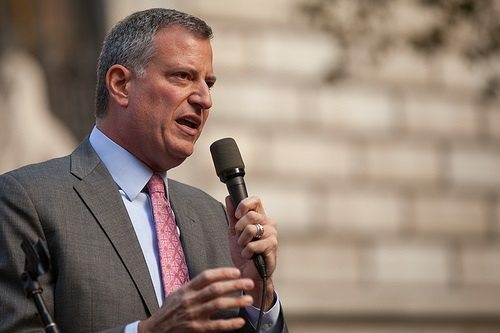 1 adviser,” Mayor Bill de Blasio announced that he was naming Chirlane McCray—his wife—as chair of the Mayor’s Fund to Advance New York City, a nonprofit entity that raises money to support a variety of city causes, according to the New York Times, which reported on the news conference with a distinct “wink-wink” tone. “This had to be someone who was as close to the core of what we’re all about as humanly possible, and I think we could safely say that no one could compete with Chirlane McCray on that particular score,” the Times quoted him as saying with a laugh. McCray played a key role in de Blasio’s campaign, and as with many first ladies throughout history, from the president’s wife to the wives of governors and mayors across America, there has been speculation and some criticism over her role in the new mayoral administration. De Blasio went out of his way to point out that his wife’s position as chair, OK’d by the city’s Conflicts of Interest Board, would be unpaid. She will oversee a staff of eight employees and work out of the fund’s current offices, across the street from City Hall. Generally, they are not part of the chain of command, so their influence over official business is usually unofficial and informal, as a confidante of the chief executive, which in itself can generate controversy. For example, the current First Lady of the United States takes an informal and unofficial role helping military families and fighting childhood obesity. Until the current governor, Jerry Brown, eschewed the role for his wife, California’s first lady traditionally chaired California Volunteers, the state’s community service and volunteerism promotional program. McCray will take over an organization with a budget of about $37 million. While donors may give any amount, donations over $5,000 must be disclosed. Under Mayor Rudolph Giuliani, the organization underwrote efforts to court host committees for conventions; under Michael Bloomberg, it supported environmental, anti-poverty, public health, and youth initiatives, reported the Times.